We are about two thirds through our season, with only an outside chance of winning both League titles. Unfortunately, once again, we did not qualify for any of the English Finals and our performances were well below expectations in all three South East Group Qualifiers. Our Golf Partnership continues its outstanding work. Our Academy Programme is also very successful with any number of talented youngsters being identified and progressing through to our Junior Team squads. All this work cannot be done without the commitment of our team of volunteers, all of whom put in an unbelievable amount of time and effort to develop the Game in the three Counties. Our thanks to all of them. Well done to all the players mentioned in these Jottings and especially to Tyrrell Hatton (Harleyford) and Craig Hinton (The Oxfordshire) who both were selected for England and played in the Home Internationals in August. Craig also won the Final Qualifying and played in the Open Championship. 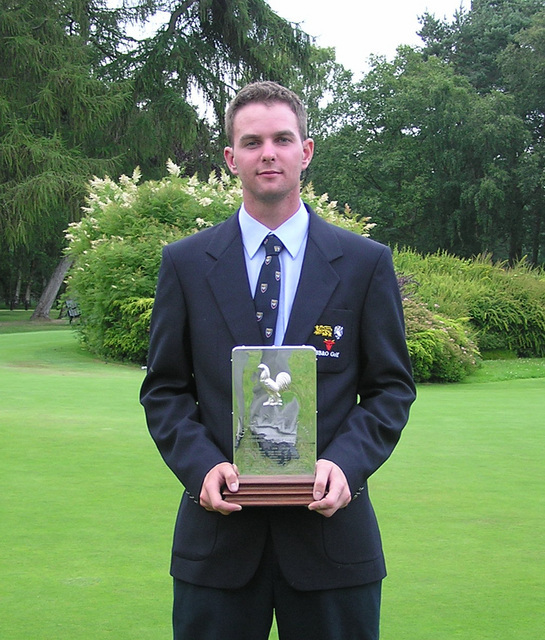 Adrian Donkersley (Gerrards Cross) has also been selected for England and will play in the Seniors Home Internationals at Woodhall Spa in September. 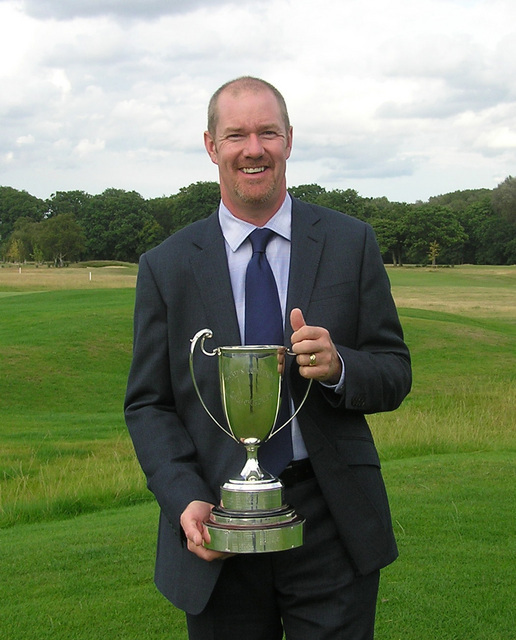 John Kemp (Woburn) won our Amateur Championship at Sonning with a score of 11 under par for the four rounds – 8 better than his nearest rivals. The County won its third pre-season Friendly against Warwickshire at Studley Wood on the 8th May. After winning the morning foursomes 3½-1½ we had a closer call in the afternoon fourballs but took them 3-2 and the match by 6½-3½. The team at Studley Wood: David Langley (Castle Royle), Andrew Lynch (Stoke Park), Ross Mitchell (East Berkshire), Dean Newbold (Frilford Heath), Malcolm Reid (Royal Ascot), Joe Richardson (Frilford Heath), Ollie Tite (Witney Lakes), Ashley Walton (Frilford Heath), Ashley Watkins (Burnham Beeches), Luke Williams (Frilford Heath). Our first League match of the year was not a good start to the season. With so many of our top players unavailable for selection, the Captain had to field an inexperienced team for this tough match against Essex at Heythrop Park on 22nd May. 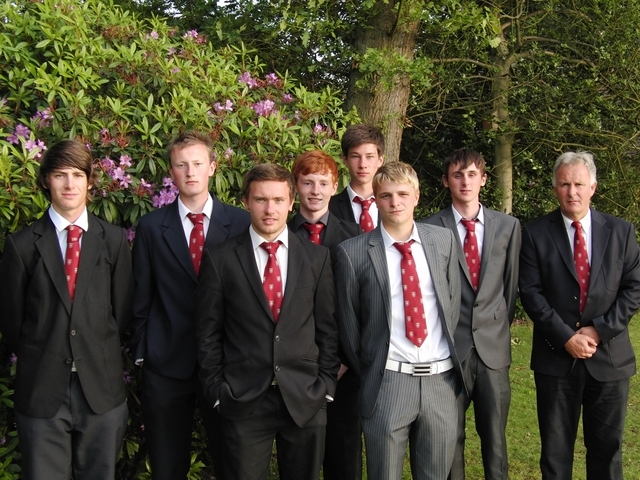 We halved the morning foursomes but were outplayed in the afternoon with some heavy losses and lost the match 7½-4½. The team at Heythrop Park: David Langley (Castle Royle), Andrew Lynch (Stoke Park), Ross Mitchell (East Berkshire), Dean Newbold (Frilford Heath), Malcolm Reid (Royal Ascot), Joe Richardson (Frilford Heath), Ollie Tite (Witney Lakes), Ashley Walton (Frilford Heath, Ashley Watkins (Burnham Beeches), Luke Williams (Frilford Heath). Our second League match was played, again, at Heythrop Park on 26th June against Hertfordshire. Again, most of our Senior players were unavailable but we did get Tom Wild back in to strengthen the team. Nearly the perfect start in the foursomes as we dropped just half a point but we knew that the Hertfordshire team would stage a fight-back in the afternoon, so the batting order for the singles was crucial. 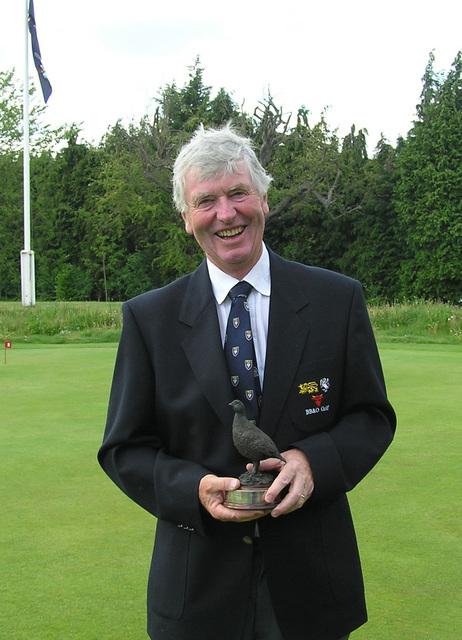 The Captain, Malcolm Reid, guessed correctly and we managed a 4-4 result in the afternoon to win the match 7½-4½. 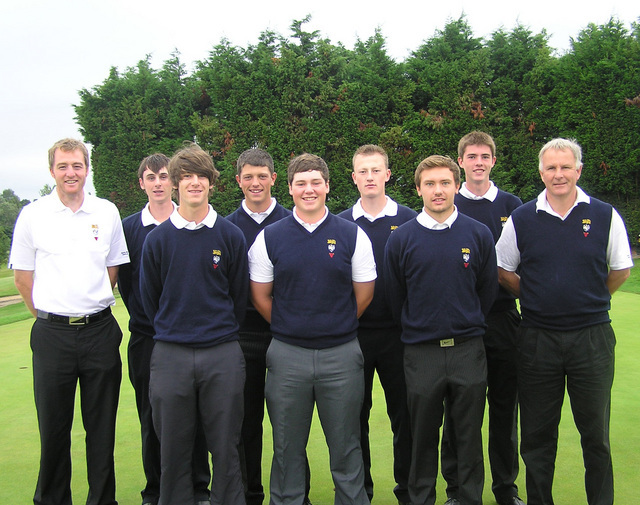 The team at Heythrop Park: Matt Johnson (Chipping Norton), Andrew Lynch (Stoke Park), Joe Richardson (Frilford Heath), Ollie Tite (Witney Lakes), Ashley Walton (Frilford Heath), Ashley Watkins (East Berkshire), Tom Wilde (Castle Royle), Luke Williams (Frilford Heath). The 3rd League match of the season took us to Dunstable Downs on 21st August to play Bedfordshire. Once again, we could not get our first choice players and once again the youngsters did us proud. Another fine performance in the foursomes and we went into (an excellent) lunch 3-1 ahead. Just Ashley Walton and Malcolm Reid had been awarded their ‘colours’ in this team but the rest all played like veterans. Good wins from the debutants, Chris Aubrey and James Foster enabled us to build on a solid start and we took the singles 5-3 for a 8-4 result in our favour. We must now beat Middlesex by at least 9-3 to win the League, anything less and we lose out to Hertfordshire. 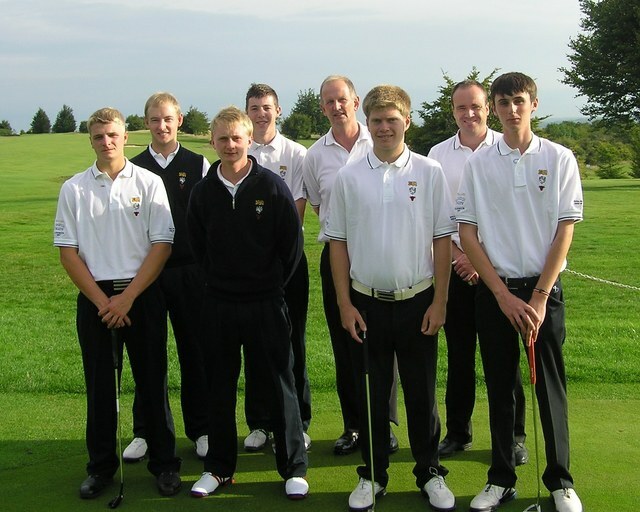 The team at Dunstable Downs: Chris Aubrey (Caversham Heath), James Foster (Newbury & Crookham), Andrew Lynch (Stoke Park), Malcolm Reid (Royal Ascot), Joe Richardson (Frilford Heath), Ollie Tite (Witney Lakes), Ashley Walton (Frilford Heath), Luke Williams (Frilford Heath). We had a good match against Bedfordshire at Abbey Hill on Saturday 18th June and won 7-5. We were without our 9 lowest handicapped players. This fixture clashes with the Sir Henry Cooper Masters, The Berkshire Trophy and GCSE and A-Levels - so did give us a chance to play some younger and higher handicapped players. Matt Milligan stepped up to the Captaincy for the day and did a great job. In the morning foursomes he played with Alistair Cameron from the U16s and in the afternoon he went out at Number 1 - earning maximum points both times. Other notable performances came from Jordan Williams who also took maximum points and Ben Beach whose short game is one of the best I have seen at this level. Two matches were finished early and agreed as a half due to heavy rain and lightning. Abbey Hill were excellent hosts and made us all very welcome. 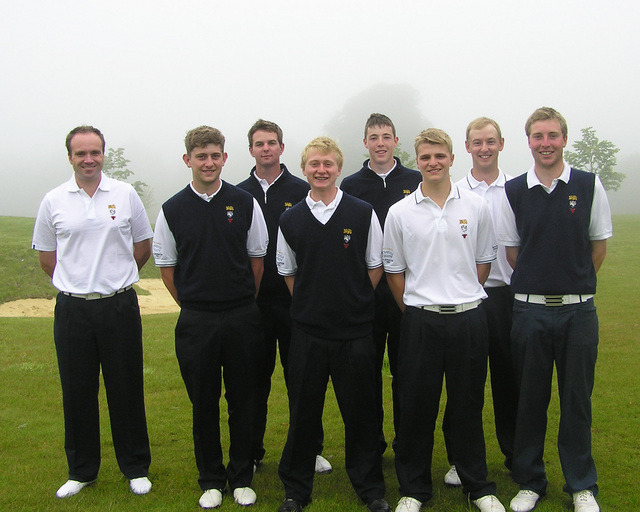 The team at Abbey Hill: Ben Beach (Stoke Park), George Bell (Harewood Downs), Tom Butterworth (Harewood Downs), Alistair Cameron (Beaconsfield), Jake Dines (Hinksey Heights), Matt Milligan (Sand Martins), Harry Wetton (Woburn), Jordan Williams (Frilford Heath). We played at Mid Herts in the first of the triangular matches on Thursday 4th August . The weather was foul and rained pretty much all day but the course held up well. The boys all played cheerfully despite the conditions and the matches were played in excellent spirit. We had the usual result of beating Middlesex comfortably 9-3 and losing heavily to Hertfordshire 10½-1½. In fairness we had a young team, without 3 of our strongest players and our lowest handicap was equivalent to the Hertfordshire number 6. In the foursomes we had a clean sweep 4-0 against Middlesex and all the matches against Hertfordshire went to the 17th or 18th. In summary we still have some way to go to catch the depth of the Hertfordshire side but this was a young team that will mostly stay together next year in this age group and do very well then. Perhaps more importantly, they are generally a charming bunch of lads with a lot of character and the Manager said it was a pleasure to look after them for the day. The team at Mid Herts: Patrick Bart (Burnham Beeches), Matteo di Carlofelice (Mentmore), Adam Dewji (Woburn), Jack Landauer (Blue Mountain), Chris Little (Frilford Heath), Max Nicholls (Newbury Racecourse), Will Preece (Chipping Norton), David Walton (Gerrards Cross). Our second League match was at The Springs on 12th August and once again we slumped to a heavy defeat to Hertfordshire 10-3. Just one win in the foursomes for Chris Little and Matteo di Carlofelice and 2 halved games in the singles were all we had to show for the day. Against Bedfordshire, we had a much better result, taking the foursomes 3-1 and despite losing the singles 3½-4½ our morning efforts saw us take the match 6½-5½. The team at The Springs: Patrick Bart (Burnham Beeches), Alistair Cameron (Beaconsfield), Matteo di Carlofelice (Mentmore), Adam Dewji (Woburn), Chris Little (Frilford Heath), Will Preece (Chipping Norton), Duncan Toms (Reading), Henry Wilson (Woburn). 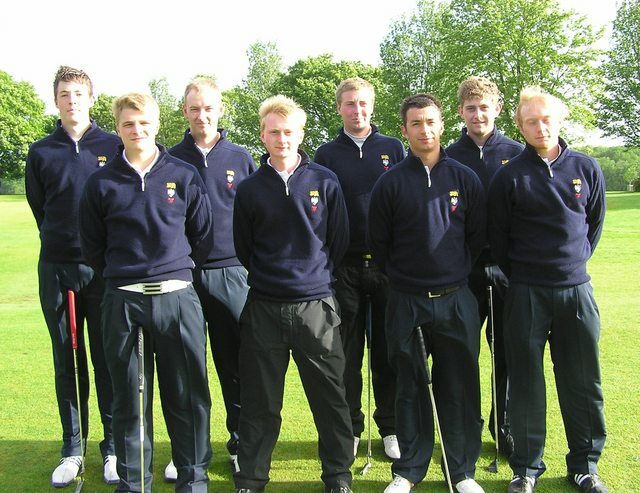 The first of our League matches was played at Chiltern Forest on 14th April against Bedfordshire and Hertfordshire. We lost to Bedfordshire 6½-8½ and to Hertfordshire 4½-10½. Not the best start to the season. While Chiltern Forest is not a long course it is quite tricky and the course was in great condition for the time of year. Both Hertfordshire and Bedfordshire had played the course at the weekend for a practice round, which came as a surprise as practice rounds were to be ‘discouraged’ when the League was set up. Obviously this gave them a great advantage – as none of our boys had played the course before. The weather was good, overcast, with little wind but even these conditions didn’t stop some matches taking over four and a half hours – totally unacceptable for match play – even in three balls. The team at Chiltern Forest: Angus Bolton (Burnham Beeches), Dylan Brownlie (Castle Royle), Oliver Carder (Henley), Zac Cooper (Harleyford), Michael East (Burnham Beeches), David Evans (Woburn), Bradley Jones (Datchet), Scott Proctor (East Berkshire), Robin Sullivan (Castle Royle), Elliot Wills (Beaconsfield). Next port of call for the boys was a visit to Elstree to play Hertfordshire and Middlesex on 29th July.We lost to Hertfordshire 5-10 but we beat Middlesex 8½- 6½. Elstree Golf Club presented the boys with an interesting test of golf and was in pretty good condition. The weather was good for golf, not too hot and not windy at all. We had a poor foursomes morning – scoring just ½ point against Hertfordshire and 2½ against Middlesex. We did better in the singles. Dylan Brownlie retired hurt after nine holes of singles giving Hertfordshire and Middlesex each a point. Dylan was up in both matches which made it all the more disappointing. Highlights were - George Gardner (East Berkshire) in his first County Match winning both singles and one of his foursomes with Scott Proctor (East Berkshire) who also won both singles matches. 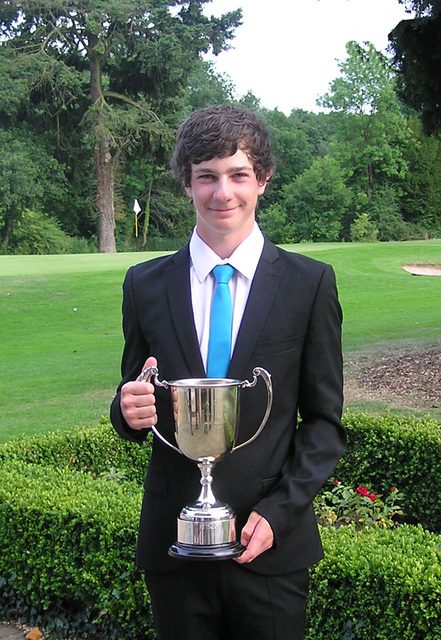 Angus Bolton (Burnham Beeches) also won both singles and secured a half in his foursomes. Robin Sullivan (Castle Royle) halved his singles with Herts and scored one and a half Foursomes points with Dylan Brownlie (Castle Royle). The team at Elstree: Sam Boffin (Hadden Hill), Angus Bolton (Burnham Beeches), Dylan Brownlie (Castle Royle), Zac Cooper (Harleyford), David Evans (Woburn), George Gardner (East Berkshire), Alex Nicholls (Beaconsfield), Scott Proctor (East Berkshire), Robin Sullivan (Castle Royle), Elliot Wills (Beaconsfield). With Hertfordshire clear leaders in the League race we needed a good result at North Middlesex on 8th August against Middlesex and Bedfordshire to salvage some pride. We put out our strongest available side and won both matches – one very easily and one quite comfortably in the end. The morning foursomes had us 4-1 up against Middlesex and 3-2 up against Bedfordshire who have a much stronger side this year and will finish as runners-up. We lost the first two singles matches to Bedfordshire giving them the edge but then won six of the remaining eight matches to win the match 9–6. We beat Middlesex 8-2 in the singles winning the match overall 12-3. It is a pity we didn’t find this form earlier in the year. Scott Proctor and George Gardner (both East Berks) who paired for the foursomes and won both and each won both of their singles. 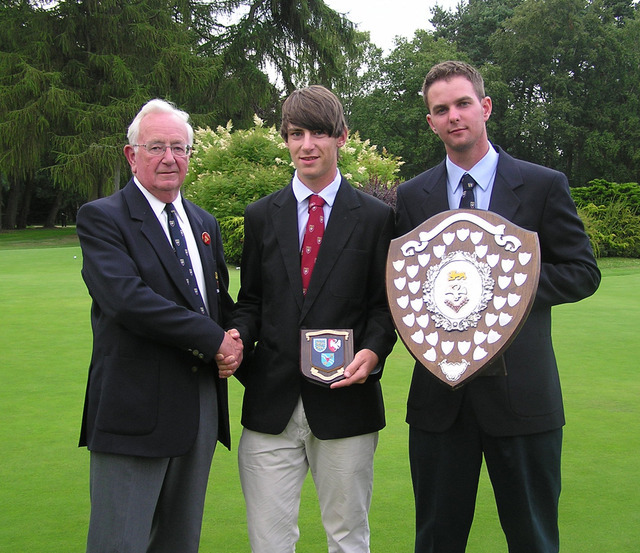 Robin Sullivan (Castle Royle) who secured 1½ points from his foursomes and won both his singles. 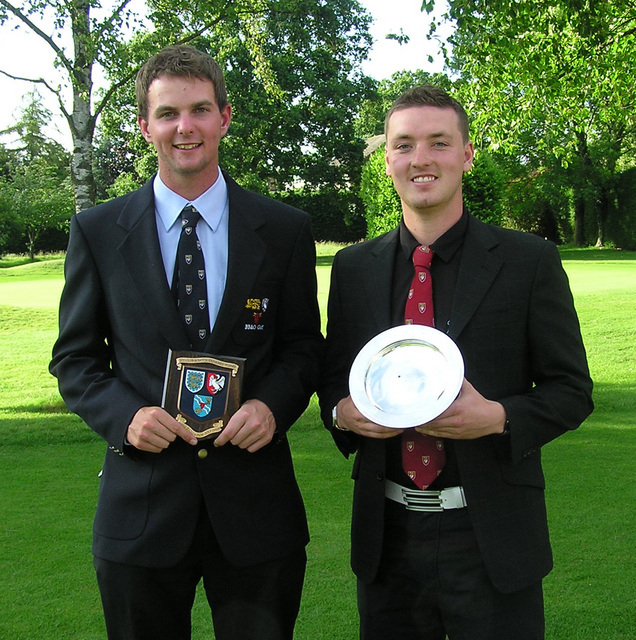 Elliott Wills and Alex Nicholls, (both Beaconsfield) won one foursomes as a pair and each won both of their singles. The team at North Middlesex: Sam Boffin (Hadden Hill), Oliver Carder (Henley), Zac Cooper (Harleyford), David Evans (Woburn), George Gardner (East Berkshire), Bradley Jones (Datchet), Alex Nicholls (Beaconsfield), Scott Proctor (East Berkshire), Robin Sullivan (Castle Royle), Elliot Wills (Beaconsfield). Our first match of the season was versus Middlesex at Gerrards Cross. A win is a win, but this was a bit of a struggle, once again, in a very closely fought match on 23rd May. After our top order had secured quite emphatic wins we struggled down the bottom of the order before Rod Crisp and Bob Clarke secured vital half points to enable us to win the match 6-4. 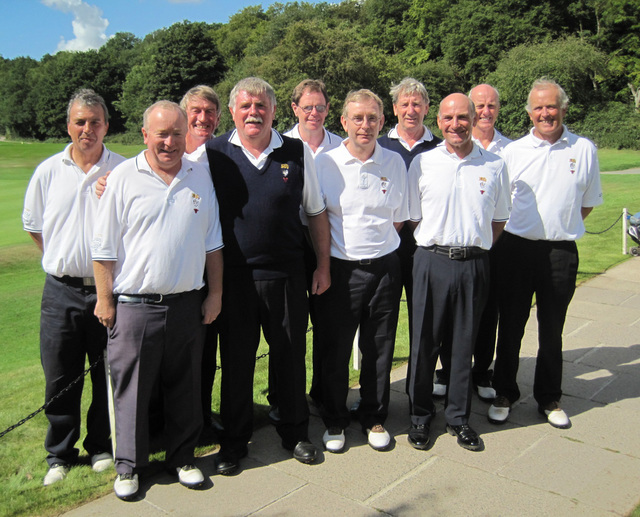 The team at Gerrards Cross: Bob Clarke (Mentmore), Rod Crisp (Ellesborough), Adrian Donkersley (Gerrards Cross), Neil Franklin (Beaconsfield), Robert Gill (Gerrards Cross), Graham Hart (Frilford Heath), Cliff Pearce (Ellesborough), Gilbert Runnicles (Gerrards Cross), Phil Sewell (Castle Royle), Jim Wilson (Frilford Heath). Our 2nd match saw us take on Bedfordshire at Burnham Beeches on 6th June. A very strong all round performance, with just one half (who it was - not to be mentioned here), enabled us to gain some valuable ‘game points’ and we took the match 9½-1½. 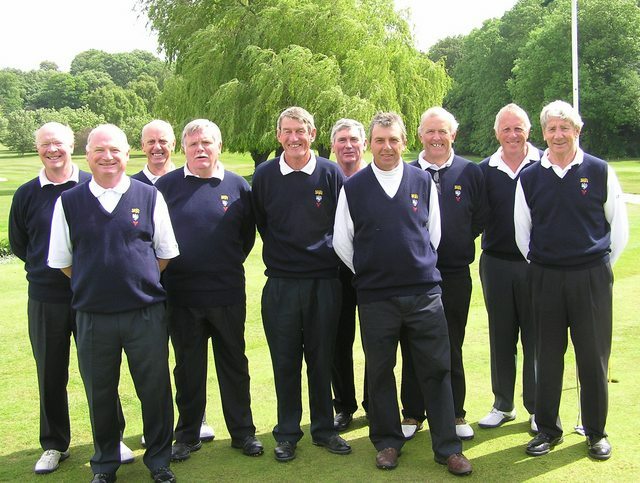 The team at Burnham Beeches: Rod Crisp (Ellesborough), Adrian Donkersley (Gerrards Cross), Robert Gill (Gerrards Cross), David Lane (Goring & Streatley), Chris Osborne (Forest AGC), Cliff Pearce (Ellesborough), Gilbert Runnicles (Gerrards Cross), Phil Sewell (Castle Royle), John Summers (Frilford Heath), Jim Wilson (Frilford Heath). Our 3rd match was against Hertfordshire at Knebworth on 7th July. This was always going to be close and we were not disappointed. As each game came in, the lead went back and forth, until finally Rod Crisp closed out his game 2/1 to secure the draw. The team at Knebworth: Ashley Brewer (Denham), Rod Crisp (Ellesborough), Adrian Donkersley (Gerrards Cross), Robert Gill (Gerrards Cross), Chris Osborne (Forest AGC), Cliff Pearce (Ellesborough), Gilbert Runnicles (Gerrards Cross), Phil Sewell (Castle Royle), John Summers (Frilford Heath), Jim Wilson (Frilford Heath). Our final match was against Essex at Theydon Bois on 15th August and a win would get us the League title once again. We picked up 2½ points from the first 4 games but after that, it was all downhill. We just managed another ½ point from the final 7 games and our extensive unbeaten run was well and truly over as we lost 3-7 Only a miracle result from the final match of the League will see us as League winners. The team at Theydon Bois: Ashley Brewer (Denham), Rod Crisp (Ellesborough), Graham Hart (Frilford Heath), Cliff Pearce (Ellesborough), Gilbert Runnicles (Gerrards Cross), Phil Sewell (Castle Royle), John Summers (Frilford Heath), Derek Walton (Frilford Heath), Steve Webb (Henley), Jim Wilson (Frilford Heath). 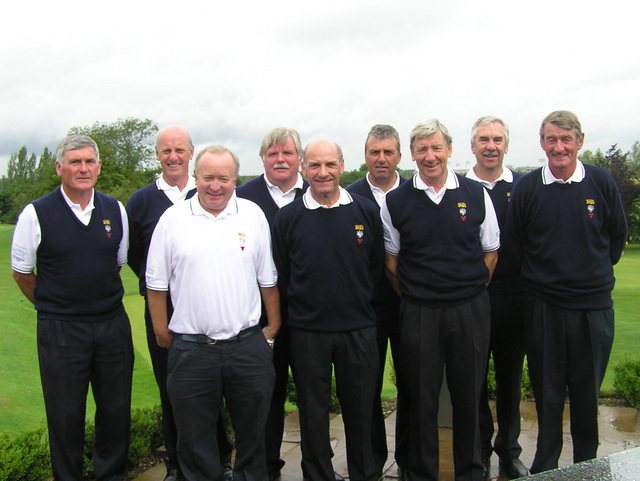 The Seniors Championship was played at Beaconsfield Golf Club on Monday 9th & Tuesday 10th May 2011. Play is split over two days and after the Monday round, just 16 of the 72 players had broken 80 as most struggled even though the weather was fine. Hugh Maurice (The Berkshire) led the way with a 3 under par 69 which gave him a 4 shot lead over Ashley Brewer (Denham) and 5 over Adrian Donkersley (Gerrards Cross) and perennial Champion David Lane (Goring & Streatley). The weather continued fine on Tuesday and the scoring improved as the players got the hang of things. Obviously, some had put themselves out of contention on Day 1 but the better players did rise to the challenge and Cliff Pearce (Ellesborough) was mounting a serious bid for the Championship and finished with a best of the day 69 to post the Clubhouse lead on 147. David Lane went out in level par and was within 4 shots of the lead and Hugh Maurice’s nearest challenger. Despite a few minor errors on the back 9 Maurice was able to hang on and his 75 was good enough for him to win his first Seniors Championship on level par. David Lane finished 1 under par for the day and 1 shot back with Cliff Pearce in 3rd place on 3 over par. 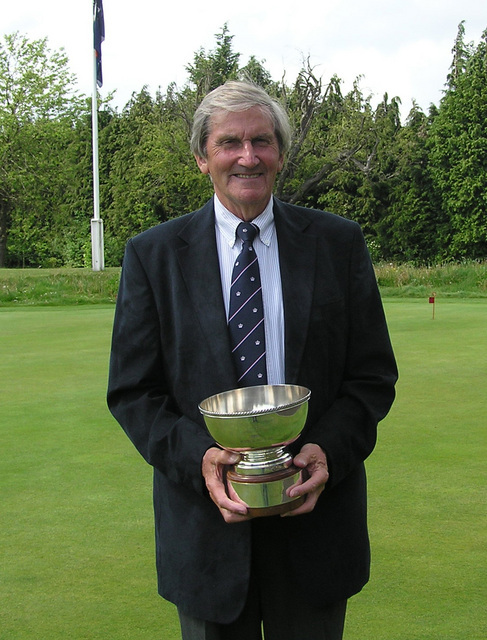 Hugh Maurice took the 55-59 Age Group Trophy, while Derek Harrison (Maidenhead) took the 60-64 Trophy. 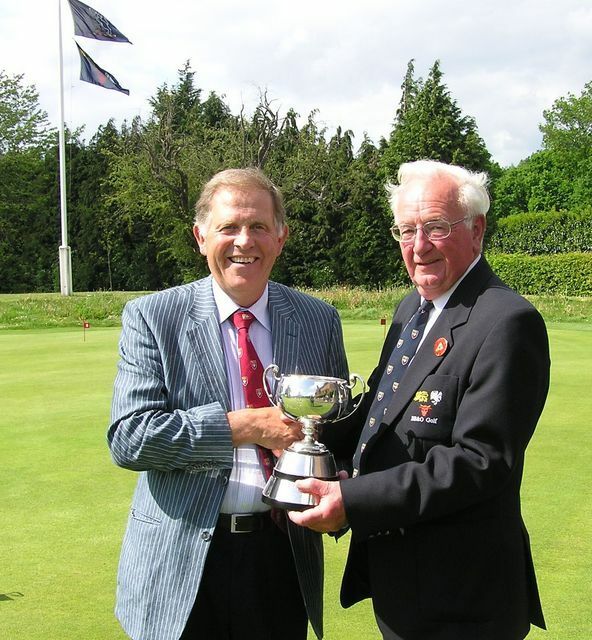 David Lane won the 65-69 Trophy and Bill Perkins (Maidenhead) took the over 70’s Trophy once again. In the Handicap section, the 141 of Colin Tungate (Reading) was 4 clear of Steve Webb (Henley) in second with Mark Williams (Maidenhead) in third. Once again Ellesborough took the Team Prize by 10 shots from Gerrards Cross. The Colts and Mid Age Championships were played at Heythrop Park Resort on Friday 10th June. The age range is up to 25 for Colts and over 25 for the Mid Age. The new course was in lovely condition but playing every inch of the 7,088 yards off the Black Tees. There would be some very tired guys at the end of the day. In the Colts Championship, the morning scoring was very average with just 16 scores under 80. Leading the way was Joe Richardson (Frilford Heath) after a very creditable 74 with Luke Williams (Frilford Heath) and defending Champion Mathew Johnson (Chipping Norton) 2 shots back on 76. In the afternoon, Dean Wright (Caversham Heath) set the mark at 150 after adding a 74 to his morning 76. Adam Batty (Hazlemere) and Mathew Johnson were playing together and with both going out in level par there was just 1 shot in it. After 15 holes they were tied but it was Mathew Johnson who finished the strongest to edge out Adam Batty by 1 shot. Dean Wright, missed out on 2nd on countback, but had the consolation of winning the ‘Busby Bowl’ in the handicap section in the Colts Championship finishing with 148 just 1 shot better than Alex Lodge. In the Mid Age Championship the scoring was a little better on average than in the Colts. Something to do with age and experience probably. After the morning round Ashley Walton (Frilford Heath) had posted the day’s best round of 72 to lead by 1 shot from John Cook (Witney Lakes) and by another shot from Mark Browning (Donnington Valley). A few more ‘veterans’ of County Championships and Trophy events were in close attendance including the Captain and defending Champion Malcolm Reid (Royal Ascot), Vice-Captain – George Wilson (Calcot Park) and Paul Heselden (Harewood Downs). Most of these ‘old boys’ improved their scores in the afternoon but the only change in the top three from the morning, was James Cook, who had picked up 4 shots on Ashley Walton at the turn and in the end his one over par 73, matching his morning effort, gave him a 4 shot cushion to win the Title. David Cowap (East Berkshire) and former County Captain showed he could still play to his handicap, despite the eleven mile walk on the day, as he won the Handicap prize and relieved the Vice-Captain of a small amount of ‘folding stuff’. The Club Scratch and Handicap Foursomes Championships were held at Reading Golf Club on Tuesday 21st June. Clubs may enter 2 teams and each team can win either or both Championships. 56 teams battled it out in Foursomes Medal which is probably the hardest form of golf known to Man and a real test of friendship. ‘Sorry Partner’ being a much used phrase on the day. After the morning round Darren Gatward and Simon Powell representing Calcot Park were leading both Championships after a 3 over par 73 net 69. Ollie Tite and James Cook (Witney Lakes) were 1 shot further back and 5 other Clubs were tied on 75 in the Scratch Championship. In the Handicap Championship, three Clubs were tied 2nd after 71s and this also looked like a close run thing as they were only 2 shots behind the Calcot Park pair. The afternoon scores did improve and in the Scratch Championship Mark Browning and Gareth Clarke from Donnington Valley had a great round of 70 to post a clubhouse score of 150. Shortly thereafter, Ollie Tite and James Cook moved into first place after matching their morning score of 74. Out on the course Tom Wilde and Nick Scrutton from Castle Royle had moved into the lead after a level par front nine and a similar and very steady effort on the back nine gave them the Title by a 3 shot margin. In the Handicap Championship, David Thomson and Neil Clayton from Witney Lakes matched their Club-mates and were also in the prizes as their net 72 took them past Calcot Park and into 2nd spot. But it was Mark Browning and Gareth Clarke from Donnington Valley who carried off the Trophy with their net 142 which was also good enough for 3rd place in the Scratch Championship. 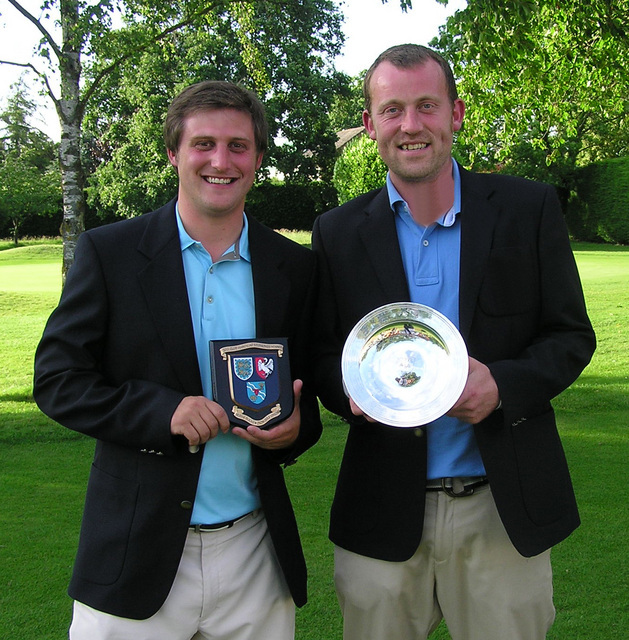 The Champion Club and Courage Trophy were played at Woburn Golf Club on the Dukes Course on Saturday 2nd July. The Courage Trophy is awarded to the leading player on the day and the Champion Club go on to represent BB&O in the EGU Champion Club finals, being played this year at Scarcroft on 3rd & 4th September. A full field of 24 Clubs competed as this tournament now is considered a major BB&O Championship and is now played at Frilford Heath, Woburn and Stoke Park on a rotating basis. Three fine venues and all a pleasure to play which is why we always expect a full field. Scoring was very good in the morning with half the field breaking 80 which is no mean achievement with a CSS of 75. Tom Wilde (Castle Royle), Craig Buttivant (Gerrards Cross) and Stephen Jensen (Woburn) were tied after 74s and defending Champion Club, Castle Royle, held a 1 shot lead over Reading with Woburn in 3rd place. Three other Clubs were tied on 154 and all were in with a shout at the Title. Scoring was just as good in the afternoon and a number of players improved on their morning scores. Best of all was Tom Wilde who posted a four under par 68 and this would set up his Club for a serious tilt at defending their Champion Club status. David Langley was continuing his steady play but it was looking like being close as the Frilford Heath team were not backing away. Dean Newbold added a 74 to his morning 76 and Sandy Bolton birdied 2 of the last 4 holes to shoot 71 and post a team score of 299 for the day. However, Wilde’s 68 would prove decisive and another 76 from Langley enabled them to enjoy a comfortable win in the end and they successfully defended their Title by a margin of 5 shots. 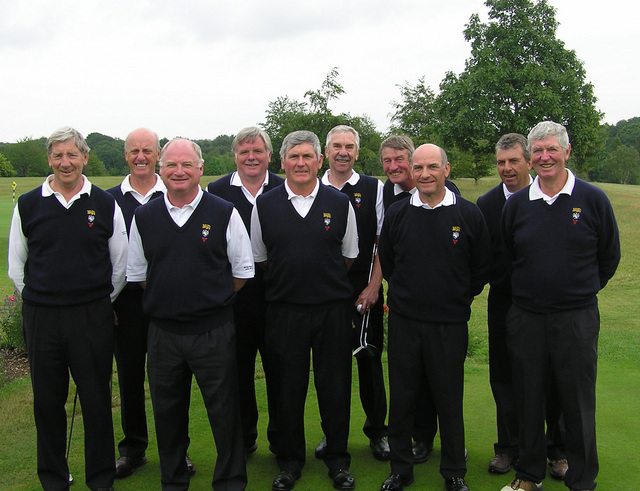 Frilford Heath were 2nd as they were in 2010 and Stoke Park improved on their 2010 effort to take 3rd place. We are looking forward to our visit to Stoke Park in 2011 and what odds on a first time ‘Home’ advantage win? 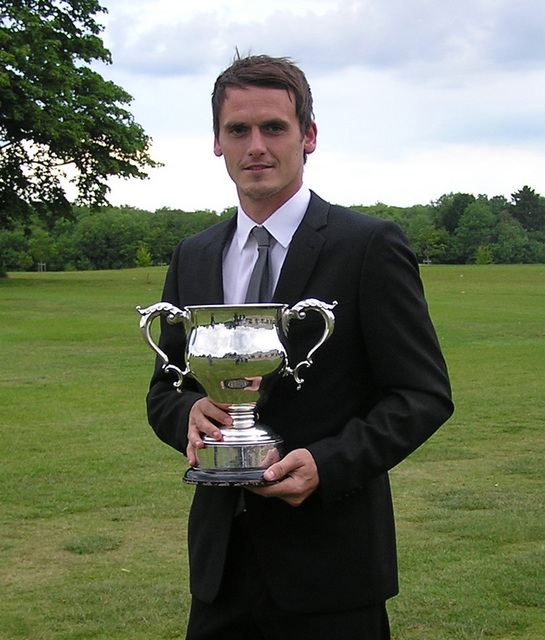 Defending Champion Tom Wilde had a 7 shot victory in the Courage Trophy with Sandy Bolton in 2nd and Craig Buttivant (Gerrards Cross) in 3rd place. 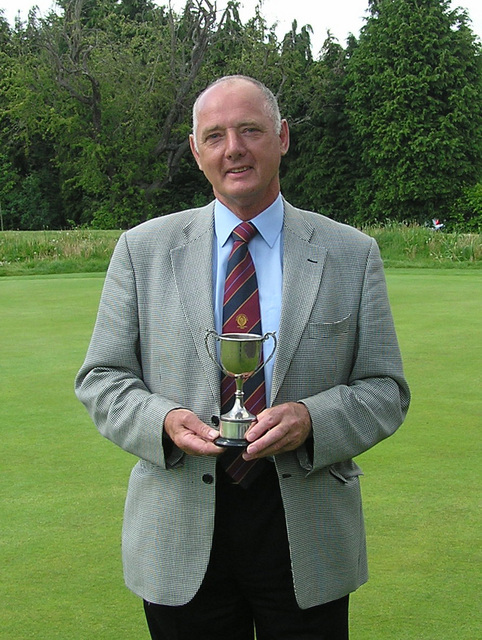 The Penfold Trophy was played at Tadmarton Heath Golf Club on Saturday 16th July. This event also serves as the qualifying round for the BB&O Amateur Championship and the top 48 players and ties gain automatic entry to the Amateur and the next 60 play in the Penfold Trophy for the remaining 24 spaces. There were 121 entries and players of 1.3 and below were entered for the Amateur Championship and players of 5.3 and over were balloted out. Once again a number players ‘forgot’ to enter in time and seemed surprised when their entries were declined. On a very tough morning, in torrential rain with the CSS going up by three, just Paul Heselden was able to match the par of 69. Due to the weather conditions, most rounds were taking nearly an hour longer than the pace of place guidelines. Surprisingly though, 24 players still managed to break 80 and they would eventually be the qualifiers for the main event. The Championship Committee held a number of meetings during the morning and with the best weather forecasts to hand, it was decided that the afternoon round be abandoned before it had started. This is not the first time this had happened in the Penfold Trophy and as the main idea is to get 24 qualifiers for the Championship proper, this seemed the most equitable thing to do. To be fair, all the players were completely drenched and play would have had to have been pushed back by at least an hour to allow people to dry out and get some lunch. There was hardly any dissent from the field when they heard the Committee’s decision, but how ironic it was that by 3.30pm as this Organiser drove home down the M40, that he needed to put his sunglasses on. A little bit of a disappointing entry for this event but it did clash with an Academy day and we will avoid that next year. Nevertheless the boys had a great day at Beaconsfield on 25th July. There was evidence of much potential from some of the younger competitors one of whom celebrated his 9th birthday that day. We are sure we will see a number of them competing for major honours in BB&O in the years to come. Nick Elmey (Drayton Park) had a comfortable win by 5 shots in the end, plying the last 11 holes in level par – a great effort. However, the main idea was for all the boys to have fun on the day and everyone went home with a prize regardless of their scores. We look forward to next year when a number of the players will still be eligible. 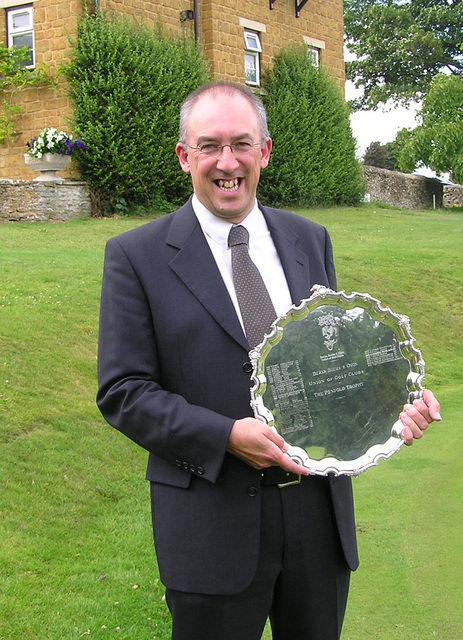 The Douglas Johns Trophy was played at Harewood Downs Golf Club on Thursday 28th July. This Open event is contested by players aged 15 years and under from all over the Country. It attracted an extremely high quality field from more than 56 different clubs, ranging from the far North of Scotland to the South West. England Boys selectors were on hand to witness golf of high calibre in testing conditions, over the tight par 69 course, which made par or better an exceptional score. Jordan Boulton (Notts) led after the 1st round with a really good score of 2 under par 67. with Sam Wilkinson (Fulford) and Marcus Sewell (Pedham Place) tied for 2nd on 70. Haydn McCullen (Delamere Forest) and Murray Naysmith (Marriott Dalmahoy) were another shot back and there were six other players tied on 72 and it looked like the winner would come from these players unless anyone else produced something really special. There was some very good golf being played in the afternoon and more than a third of the field score 72 or better. A very high standard of golf. The early lead went to Marco Penge (Worthing) after a 1 under par 69 which was immediately matched by Jack Sing-Brar (Bramshaw), who lost in a play-off last year, to post 140. Jordan Boulton, meanwhile was continuing his fine form and reached the turn in 1 over par and now had just a 2 shot lead over his nearest challenger Haydn McCullen. As they went into their respective back nines both players made some birdies and with just two to play there was nothing in it. The decisive blow came at the short 17th which Jordan birdied and with both players making par at the 18th the Trophy went to the Notts player for his 1 under par total for the day with Haydn in second place at level par. 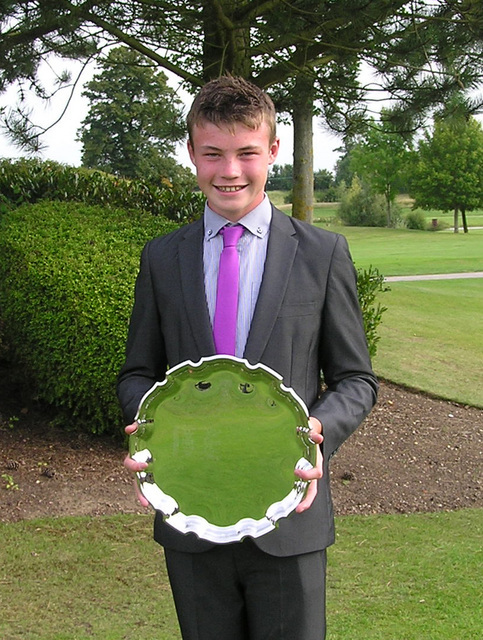 The Junior Championship was played at Buckinghamshire Golf Club on Monday 1st August. We have moved this event away from the Easter holidays as it is felt that, for such a prestigious event, we could do with some better weather than we have experienced in the past. 60 Boys aged 18 and under contested the Championship on this testing layout playing nearly 6,900 yards. Weather conditions were excellent and a great day for scoring. Five players broke par in the morning and leading the way with a fine score of 70 (2 under par) was James Butterworth (Harewood Downs) closely followed by 4 players on 71 - David Langley (Castle Royle), George Bell (Harewood Downs), Robert Grant (Mentmore) and Matt Smith (Stoke Park). There were several others not far behind having scored 73 or better including Tom Butterworth (Harewood Downs) who had a 3 shot lead in the Under 16 Championship. The scoring in the afternoon was not quite as good as the heat took its toll of some of the players. As the day went on it looked like it would be a two horse race as David Langley and James Foster (Newbury & Crookham) both reached the turn in 2 under par and level par respectively for the day. Their nearest challengers at this point seemed just a bit too far off the pace. 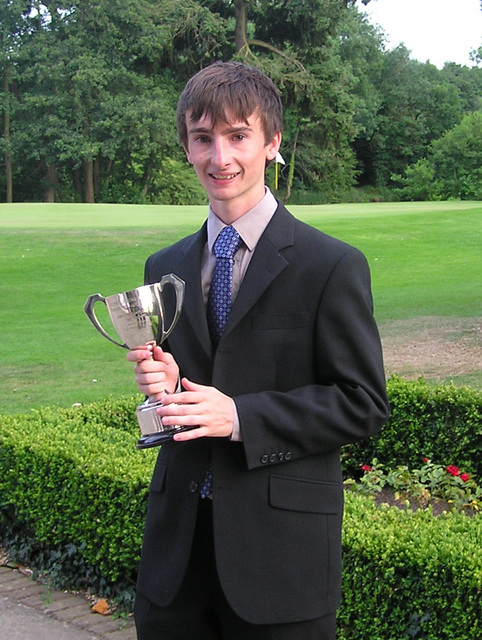 However, Tom Butterworth was finding his earlier form after a disappointing front 9 and had 3 birdies to take him within a shot of the lead, but unfortunately his finish was not as he would have liked and eventually he had to be satisfied with taking the Handicap Trophy by a clear margin of 4 shots. Meanwhile the main protagonists were playing their last 9 very well and with numerous pars between them it was David Langley’s birdie at the 16th that finally gave him the breathing space and still a 2 shot lead as he came to the last. A very steady 3, matched by James, saw him home in 1 under par and 3 under for the day to win by 2 shots. Dean Marshall (Stoke Park) had also played well all day and he finished 3rd after an excellent 71. 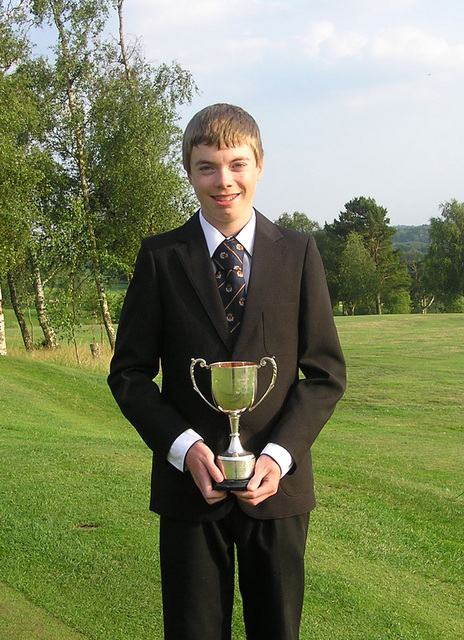 Sam Brass (Castle Royle) just pipped James Butterworth on countback for the Under 16s Trophy. 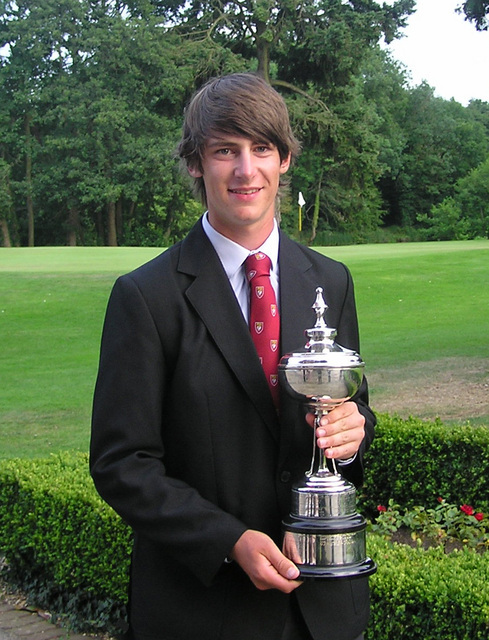 The 82nd Amateur Championship was played at Sonning Golf Club on Friday 5th & Saturday 6th August. The format for this Championship is that the top 48 (based on exact handicap) are entered automatically and there are 24 qualifiers from the Penfold Trophy. The field was competing for just 16 places (and ties) for the final 36 holes on Saturday. On the first day there were plenty of good scores both morning and afternoon. Some had found the greens very much to their liking and Tom Wilde (Castle Royle) and Stephen Jensen (Woburn) posted 3 under par 67s and Chris Heslip (Chipping Norton) a fine 68 on the first morning. The afternoon produced 14 scores of par or better, but the outstanding achievement was the course record 64 achieved by Chris Aubry (Caversham Heath) which added to his morning round put him in 4th place. Stephen Jensen produced another great round of 66 to lead the qualifiers for day 2 closely followed by John Kemp (Woburn), who was now qualified for BB&O, after many years as a Bedfordshire player. His 65 had been a model of consistency. James Foster (Newbury & Crookham) and Chris Heslip were tied at 138 and 5 off the pace. The cut fell at 143 and 21 players went through to the second day. The 3rd round is considered to be ‘moving day’ and as such, once again, some moved forward and some backward. Paul Raines (Winter Hill) had a fine 67 in the morning to move into contention and the 67 of Andrew Lynch (Stoke Park) also moved him well up the field. Stephen Jensen could not make things happen quite like day 1 and his 72 saw him lose a lot of ground to John Kemp who kept up his remarkable run by shooting yet another 5 under par 65. His Club mate Lindsey-Ben Woolford also moved into contention after a solid par round. Kemp went into the last round with a 7 shot lead over Chris Aubrey and it was just a matter of being patient and using his vast experience to capture the title. Just two players pushed him at all and the round of 66 from Woolford and the 68 from Lynch hardly made any impression on the leader as he played conservatively throughout the afternoon, dropping a couple early on but then getting them back quite quickly to re-establish his buffer. He moved to 12 under par on the back before dropping one near the end and the closest anyone got to him was 6 shots back by Woolford with only 2 holes to play. 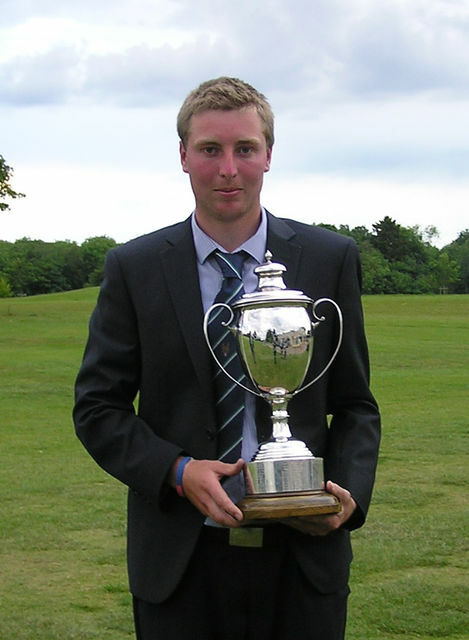 A very worthy winner of the 82nd Amateur Championship – John Kemp – by 8 shots at 11 under par. 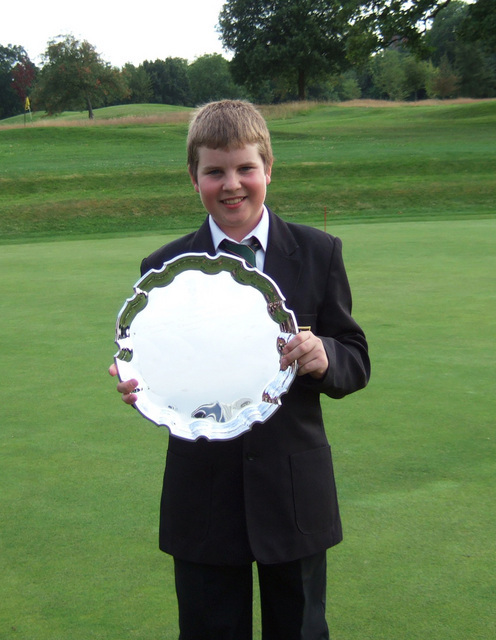 The Boys 14 years and Under Championship was played at Castle Royle Golf & Country Club on Monday 22nd August. There was a good entry of 45 boys with handicaps of 22 or less for this Championship, now being played in August to get some better weather than in the October half-term. Once again we had a dry day and quite sunny. Most of the Boys found scoring difficult with the course playing quite long and there were plenty of nerves around as a lot of the lads had not played in a County event before. The early leaders were Damien Hewitt from the home Club after a very good 76 off his handicap of 9. This was matched by Elliot Wills (Beaconsfield) who won the Under 12s Championship last year. Out on the course there was a fierce battle going on for the top prize and the lead changed hands a few times on the back nine. Patrick Bart (Burnham Beeches) seemed to have things under control until the notorious 16th got the better of him. David Evans (Woburn) was also going well until he dropped a couple mid way through the back nine and it was Chris Little (Frilford Heath) who played the steadiest and his birdie at 11 got him to one over for the day and he then reeled off 7 pars to tie his playing partner David Evans and win the Title on countback for the second year running. In the handicap prize section Damien Hewitt took the honours with Dylan Brownlie (Castle Royle) and George Marsh (Chartridge Park) in 2nd & 3rd after fine rounds of net 67. Played at Blackmoor Golf Club on 1st June. Our Team of 6 players were: George Abbott (The Oxfordshire), James Foster (Newbury & Crookham), David Langley (Castle Royle), Matt Milligan (Sand Martins), Joe Richardson (Frilford Heath) and Josh Stanners (Hazlemere). The format is 5 scores from 6 count from each round. Surrey were favourites, with Essex and Kent close behind on handicap. Our combined handicaps were 4 and so our best hopes would be for a podium finish. Our players were lying joint 4th - a very disappointing 13 shots off the pace after the morning round, with the best score coming from David Langley with a 2 over, a very strict par, 71. Everyone else seemed to struggle on the tight course. The afternoon faired little better with only Josh Stanners posting a very respectable score of 68. We finished a disappointing 7th with Surrey once again running away with the title that they have now won 5 times in the last 6 years, they go on to represent the South East at the EGU final in August. Played at Mentmore Golf & Country Club on 14th & 15th June. The format is 5 scores from 6 to count and our team was Ashley Brewer (Denham), Adrian Donkersley (Gerrards Cross), David Lane (Goring & Streatley), Hugh Maurice (The Berkshire), Cliff Pearce (Ellesborough) and Phil Sewell (Castle Royle). With ‘Home’ advantage we hoped to avenge a long string of second place finishes to Kent. After day 1 we were actually in the lead despite a fairly average performance, apart from an equal best of the day 2 under par 70 from Adrian Donkersley and a level par round from David Lane. Our hopes were high and if everyone performed well, we could actually win this event. Hertfordshire were 1 shot behind us and Kent 4 behind. Day 2 came and we never looked in with a shout. As we dropped shots, Kent were picking them up and after 9 holes we were pretty much out of the running. We finished 9 shots worse than on Day 1 and with Kent improving by 10 shots we finished 2nd again, this time by 13 shots. Kent took their 8th title in a row and it is now getting even more boring! Next year we are at Moor Park and maybe - just maybe. Played at Ashridge Golf Club on Saturday 9th July. Our Team of 6 players and 1 reserve were Sandy Bolton (Frilford Heath), Tyrell Hatton (Harleyford), Craig Hinton (The Oxfordshire), Andrew Lynch (Stoke Park), Max Smith (Newbury Racecourse), Ashley Walton (Frilford Heath) and Tom Wilde (Castle Royle). The format is for all 6 scores to count from each round. The standard was extremely high again this year with just 4 players not scratch or better. Our morning did not get off to the best of starts when England International, Craig Hinton had to withdraw as he was carrying a back injury, which caused him some pain during the warm up. As he was playing in the Open Championship the following week, we decided to bring in Max Smith as substitute. We had some good scores in the morning with Tyrell Hatton leading the way with a fine 5 under par 67. Our combined total of 439 left us 9 shots back from leaders Surrey and we felt we had a chance of catching them in the afternoon. Crucially though, we suffered another injury as Max Smith damaged an already fragile wrist hitting a tree root. He battled on as all the scores count but it became clear that his score would be in the eighties. The rest of the team were unaware of the predicament and collectively they finished 4 under par again with Tyrell Hatton with the best score of 68. His score of 9 under tied him for the individual prize. Realistically, even if Max Smith had scored a level par round we would still have fallen 12 short of Surrey’s winning score of 9 under par which was a great effort with their worst player being just 2 over par for the day. Played at Sudbury Golf Club on 17th & 18th August. Our Team of 7 players were: George Bell (Harewood Downs), James Foster (Newbury & Crookham), Luke Fitzpatrick (Stoke Park), David Langley (Castle Royle), Matt Milligan (Sand Martins), Josh Stanners (Hazlemere), Jordan Williams (Frilford Heath). The format is to play 2 foursomes games both morning and afternoon. Counties are allowed to play any 6 of the 7 players throughout the Championship. With 11 Counties in the English Golf Union South Eastern Group, two Counties must drop out each year to allow the event to be completed in two days. On the first day we played Kent and Hertfordshire. This would be a tough match with Kent and Hertfordshire having very strong teams. An excellent morning with wins against Kent 2-1 and the same result against Hertfordshire 2-1. That was two of our biggest threats out of the way. The afternoon matches were against Middlesex and Hampshire and again we played well to win both 2-1. We were lying 1st after Day 1 on 8 points with Surrey our closest rivals on 6 points. On the morning of Day 2 we took on Essex and Surrey We lost the Essex match 2-1 but beat Surrey by the same score. We were still leading the Championship, but now by just 1 point from Essex who would be playing Hampshire and Hertfordshire. Kent lying 3rd would be playing Surrey and Middlesex and Hertfordshire were 4th. We had to take on Suffolk and Bedfordshire and winning those 2 matches against the weakest opposition at the tournament would give us victory. We were very confident. We went out to play but after no more than an hour the course became unplayable due to torrential rain. Play was suspended for an hour and we hoped to get back out to complete the games. This proved not to be the case and the rain continued in the area for much longer than predicted. The Committee decided to abandon the matches and we were awarded the Trophy based on the current standings. We would almost certainly have won if we had continued so most of the County Representatives were happy with the decision. Overall a pretty good performance from all the players and well done.